The Swiss Parliament – or better the Federal Assembly – was installed in 1848 when the former confederation of 25 independent cantons became a federal nation state. The form and organization of the Parliament was one of the main points of discussion while drafting the Constitution. Those in favour of a strong nation state - the liberal and predominantly protestant cantons which won the short civil war (“Sonderbund War”) - wanted a National Assembly with a composition reflecting the prevailing population proportions of the cantons. This would have put the smaller predominantly conservative and catholic cantons at a considerable disadvantage. They wanted a revised form of the Federal Diet (the legislative and executive council of the Swiss confederacy prior to 1848) representing the cantons equally. This, however, would have prevented the Liberals who were in the majority and located in the larger cantons of the Central Lowlands from building a more centralized and unified nation state. After laborious discussions a compromise was reached in the form of a two-chamber system following the model of the United States of America: a smaller chamber representing the cantons and a bigger chamber representing the citizens. The two Chambers were given equal power. In a comparative perspective Swiss bicameralism is therefore similar to countries like the United States, Canada, Australia and Germany since the two chambers are of equal importance (symmetric) and they are elected differently (incongruent). The Council of States (The Chamber of the Cantons, the upper house) consists of 46 seats. Regardless of their population each canton sends two representatives to the Council with the exceptions of the six formerly called half-cantons which only have one representative. The Members of the Council of States are generally elected in a majority system. Since the elections take place according to cantonal legislation some – although very rare – differences exist between the cantons (different electoral day, PR system, foreigners have the right to vote). The National Council (the People’s Chamber, the lower house) has 200 Members. The number of seats of the cantons varies according to the cantons’ population: the canton of Zurich, for example, has 34 seats, the canton of Glarus only one. The electoral system for the National Council is – by national electoral law – a proportional system (PR) with open lists. The voters have the possibility to customize their ballot paper by taking candidates from different parties and putting them on an empty list or by discarding candidates from a party list and replacing them through candidates from other parties (“panaschieren”). They can also express their preferences for specific candidates by writing down their names twice instead of once (“kumulieren”). The strongest parties in the Council of States, after the 2011 elections, are the Christian Democrats (CVP) with 13 seats, followed by the Liberal-Radical Party (FDP.Die Liberalen) and the Social Democrats (SP) with 11 seats and the Swiss People’s Party (SVP) with 5 seats. The strongest party in the National Council is the Swiss People’s Party (SVP) with 54 seats (26.6 per cent of the vote), followed by the Social Democrats (SP) with 46 seats (18.7 per cent of the vote), the Liberal-Radical Party (FDP.Die Liberalen) with 30 seats (15.1 per cent of the vote) and the Christian Democrats with 28 seats (12.3 per cent of the votes). After a long period of extreme stability the Swiss party system has changed considerably since the beginning of the 1980s. The Liberal-Radical Party, the founding fathers of the country, and the Christian Democrats, its opponents, started their decline. With the Green Party a new actor entered the political arena, and at the beginning of the 1990s the Swiss People’s Party started off to become the largest party. The changes to the party system also altered the balance of power in Parliament, especially in the National Council. The strength of the parties in the two chambers, nowadays, differs quite considerably. There are three parties (Christian Democrats, Liberal-Radical Party and Social Democrats) with almost an equal number of representatives in the Council of States, and the Swiss People’s Party and the Social Democrats are holding the largest numbers of seats in the National Council. This has made policy making more complicated. If there is no agreement between the two Chambers, differences have to be eliminated in a rather complicated and time consuming procedure. The most striking characteristic of the Swiss political system and the functioning of the Parliament become obvious when we look at the way the government is composed. It is the Federal Assembly which elects the seven members of the government for a four years period. There are, however, no possibilities to dismiss the government if it loses the support of the majority of the Parliament and its projects are not approved, nor has the government the possibility to call for new elections. 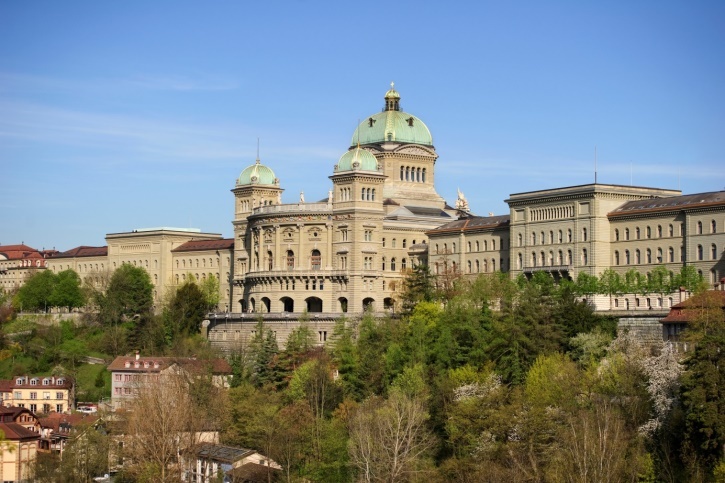 For this reason, the Swiss system is often called a hybrid system since it combines elements of a presidential system (a guaranteed legislature of the government for four years) and a parliamentary system (election of the government through the parliament). The members of the government usually represent the most important parties (“Konkordanz”). The parties in Parliament agree on the distribution of seats among them on a more or less voluntary basis. There is no coalition program they have to agree upon. After the national elections the new Parliament elects the members of the government and that’s it. Between 1959 and 2003 the Swiss government was composed of two members from the Liberal-Radical Party, the Christian Democrats and the Social Democrats and one member of the Swiss People’s Party. This period is commonly referred to as the time of the “magic formula”. With the ascent of the Swiss People’s Party the composition has become more contested and less stable. One reason for the integration of the most important parties into government is the “threat of direct democracy”. If an important party is not integrated into the government, it is more likely to fight governmental decisions by the means of a referendum. Nowadays, however, even parties represented in government do not feel obliged to abstain from using the means of direct democracy. Another reason is a more genuine sense of power sharing. It is felt that the most important parties should share governmental responsibilities and that they should strive for solutions which find broader majorities. The places where such majorities are found are the permanent committees of the two chambers of the Parliament in which all the parties are represented according to the number of seats in Parliament. The committees – often in cooperation with the government and the administration – carry out a preliminary examination of the issues allotted to them and announce their position to the plenum which takes the final decision. In order to bring a project successfully through the committees and the chambers, a sound majority of MPs is needed. Depending on the issues at stake, these majorities unite different parties and sometimes they include also members from parties which are officially against the project. Changing majorities according to the issues at stake and the final solution proposed are not seen as a problem, on the contrary. It is seen as a sign that the parties actively try to find solutions which are supposed to be based on compromise and mutual understanding. The meetings of the committees are not open to the public neither are the minutes of the meetings in order to give the members the possibilities to express their positions more freely. The committees together with the parliamentary groups, individual members and parties bring forward their requests, launch new laws or obtain information from the government making the Swiss Parliament a “working parliament”. The interior of the Parliament differs considerably from the UK Parliament and looks more like the EU Parliament. The idea is not that one party should govern alone and take all the responsibility; it is the search for compromise and broadly accepted solutions. A part from that, however, politics in Switzerland are also about interest and power. Ladner, Andreas, "Political Parties", in: Klöti, Ulrich et al. (eds), Handbook of Swiss Politics. Zürich: Neue Zürcher Zeitung Publishing, 2nd edition, pp. 309-334, 2007. Lüthi, Ruth (2007). „The Parliament“, in: Klöti, Ulrich et al. (eds). Handbook of Swiss Politics. Zürich: Neue Zürcher Zeitung Publishing. 2nd edition. pp. 121-144. Schwarz, Daniel, Lisa Schädel and Andreas Ladner (2010). “Pre-Election Positions and Voting Behaviour in Parliament: Consistency among Swiss MPs”. Swiss Political Science Review 16(4): 533-64.